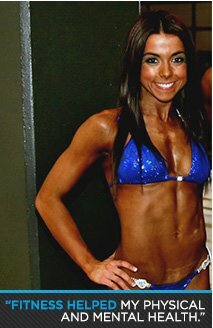 Fitness Amateur Of The Week: Molly Has Muscle! Molly saw the light when her fear of bulking receded. Now she lifts heavy and looks strong and beautiful. 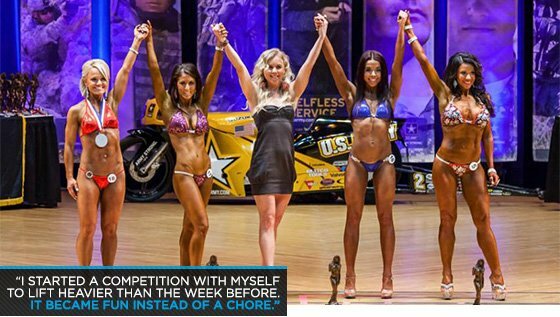 See what training regimen built her stage body! I've been thin my entire life and never gave much thought to what I ate. I hit the gym once every few months and only used the elliptical. One day, a friend and I went to the gym when they were doing free body fat tests. I thought I'd have a stellar number, but realized it was much higher than I anticipated. I had never heard the term "skinny fat" before, but that's what I was. A few months later, I tried on a pair of shorts and looked terrible. The next day, I started running, and a few weeks later I got a gym membership. When I initially started lifting, I only trained abs and did a few sets of leg press occasionally. I didn't want to get bulky. Looking back, that makes me laugh. After a while, I met people at the gym and picked up bits of information. I wasn't seeing results, so I did my own research, shaped up my diet, cut out alcohol, cut back on ab workouts, and finally saw results. I started using the machines and did full-body workouts, and later alternated between upper and lower-body exercises. Then I met my boyfriend who introduced me to the world of heavy lifting. I started my fitness journey at 112 pounds and weighed 118 pounds after a year. I lost fat and gained muscle. By May 2013, I stepped on stage at 109 pounds and 9 percent body fat. Fitness helped my physical and mental health. I suffer from depression, and fitness was the best medicine. I love lifting heavy. During the offseason, I do very little cardio. In season, I do moderate cardio five days per week for 45 minutes. I work each body part once per week, aside from legs, which I work twice per week. I eat 5-6 meals per day and bring Tupperware everywhere, especially during contest prep. In season, I cut out sugar, gluten, and dairy. My passion for fitness emerged when I saw my body change and noticed changes in my mood and attitude. I started a competition with myself to lift heavier than the week before. It became fun instead of a chore. Now I look forward to it. Stepping on stage and showing off your hard work is an amazing feeling that's beyond worth it. I get motivation from my friends, family, and people at the gym. It's inspiring to watch people change. I love the feeling I get from working out and eating healthy. It keeps me motivated to stay on track. I want to break the stereotype that girls aren't strong. Strong is beautiful! My boyfriend keeps me motivated. He gives me a push in the right direction and is a positive influence. I started "liking" all the fitness pages I could find on Facebook. I searched through pages of motivating pictures and quotes which pushed me to stay on track. I plan to compete in more shows. I'm trying out fitness competitions with bikini and figure. I love fitness because I used to be a gymnast and thought those days were over. Fitness routines pump up the crowd and the women are strong and motivating. Ultimately, I would love to obtain an IFBB pro card. It gets difficult, and you'll want to give up, but don't! The payoff in the end is beyond anything I can describe. The second I walked off stage, I felt like I could do anything. Compete only for yourself, no one else. Andreia Brazier. She's strong and absolutely beautiful. I strive to be like her. Bodybuilding.com is where I go for answers. I browse the site every day and go there for clothes, supplements, diet tips, exercises, motivation, and anything else you can think of.